The article moves from a sensational case with a responsum of the early classic jurist Proculus, concerning the sale of the Lago di Bracciano to Rutilia Polla, who also bought 10 feet of shoreland around the lake itself. The implementation of the contract caused problems, because of the rise of the water surface, which covered all the 10 feet from the shore, and Rutilia asked for 10 more feet of shoreland. The answer of Proculus is correct as well as impractical: he just recognizes to the woman the right to have those 10 feet by the lake as it was at the time of the conclusion of the contract, practically denying her right and possibility to accede to the lake she had bought in order to run a fishing business. The author compares the juridical point of view on the case with the archaeological evidences and the literary accounts, getting to the reasonable persuasion that it was a real case, supposing a specific dating for it and retracing the social and economic background of it, as well as the juridical point of view. Key words: time of the contract, rights on the lake basins, implementation of the contract, lake overflow, contract interpretation. This paper is about the fragment D. 39.3.2.5, concerning the function of the actio aquae pluviae arcendae and its fundamental feature, according to which the risk of damages by rainwater is to be connected with an opus manu factum (such as an agger artificialis) on the neighbour’s lot. The author suggests the conformity of the text to the classical criteria elaborated by the iuris prudentes on applying this ancient civil action. Particularly, she tries to demonstrate the authenticity of the sentence showed in the second part of the fragment (quamquam tamen rell. ), based on two different solutions for the owner, who could receive damages as a consequence of the undoing of an agger artificialis cuius memoria non exstat, on the neighbour’s lot: an actio utilis (that is to say an extension of the same actio a.p.a.) or an interdictum. These remedies, indeed, were typical in the classical process per formulas and were established on the Roman praetor’s discretionary power. Key words: Stream of rainwater, man-made embankment, risk of damages by rainwater’s power. The objective of the essay is to analyse Ulp. 53 ad ed. D. 39.3.4 by highlighting, also through palingenetic links, the different approches of three jurist: Labeo, Julian, Ulpian. 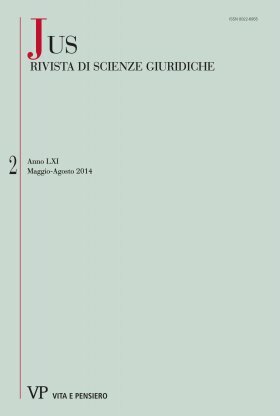 The fragment analyses the issue of passive legitimation to the actio aquae pluviae arcendae when there is no coincidence between the auctor operis and the dominus fundi; from another point of view the fragment can be analysed in the context of the researches about the Roman concept of environmental safeguard. In the fragment it is evident a constant relationship between private and public interests and therefore it is possible to confirm, also for the period from the 1st century B.C. to the 2nd century A.D., that the jurists were evaluating the issues about neighbours even in the light of public interest. In this perspective it is also possible to identify a concept of common interest with reference to the proper flow of rainy waters. This paper contains an exegetical analysis of D. 39.3.2.1,2,4,7 Paul 49 ad ed. on “fossae agrorum siccandorum causa factae”, namely ditches dug between or inside the properties for the purpose of draining the land. The exegesis, while not neglecting the examination of the hypothesis of interpolations or the attempted integrations proposed by the doctrine on these texts, attempts to combine legal knowledge with both archaeological findings and agronomic Latin sources, also by examining the current practice of land reclamation in the cultivation of properties. Key words: actio aquae pluviae arcendae, water, reclamation, drainage, furrow, ridge, ridging, water furrow, ditch. This essay analyzes the regulation made by the praetor and concerning the protection of the flumina publica. Particularly, it focuses on the couple of interdicta (both prohibitorium and restitutorium: D. 43, 13, 1 pr. - 9; D. 43, 13, 1, 11-13) aimed at preventing any change in the river flow (the so – called ‘aliter fluere’ in the exact words of the magistrate), and possibly restoring the status quo ante in case of violation of the prohibition. Following Ulpianus’ Commentarium ad Edictum, we will debate about the nature of the damage done by modifying the rigor or the modus of the river and, most of all, about the controversial relationship between public and private utilitates. Key words: Roman Law, Public Rivers, Private and Public Interests, Protection by Interdictum. The problem of public water supply is outstanding in Roman history. This issue has not been deeply studied in its juridical aspects with reference to Late Antiquity. Here two imperial laws are examined: the former, CT. 15.2.8, which was unexspectedly sent to praefectus praetorio Messala, speaks of the repression of unlawful derivations in the aqueduct Aqua Augusta; the latter, C.11.43.6, stores Aqua Hadriana’s water in Costantinople to public baths and to Achilles’ thermal baths. The imperial laws show Roman interest in big towns and strategical areas, underestimating the needs of the countryside. Key words: Late Antiquity, Roman Aqueducts, Flavianus, Aqua Augusta, Cyrus, Aqua Hadriana. The essay deals with acquire of ownership by alluvial activity in Roman Law, with particular reference to a constitution issued by Theodosius II in 440, happily known in its reasonably original extension (Nov.Th.20, sum up by Justinian’s code commission in 534 [C.7.41.3]). The topics herein studied are juridical nature (increase of land that borders with a river) and legal effects of ‘adluvio’ (acquisition of alluvial increase by the land owner rather as a juridical acquire ‘iure gentium’ than as a mere physical increase of land with no legal matters related to it). A significant connection with other fluvial events that gained relevance in Roman law (known in legal tradition as ‘avulsio’, ‘alveus derelictus’, ‘insula in flumine nata’) is always set forth in the article. Key words: Roman Law, Rivers, Acquisition of land property by alluvial activity. Comment les arpenteurs, qui font à leur façon æuvre doctrinale, ont-ils conçu le rapport entre la centuriation et les fleuves dans l’ager divisus et adsignatus? Deux solutions différentes ont été retenues, celle de Pisaurum et celle d’Emerita Augusta. D’autre part, la question de l’eau dans les territoires divisés par la limitation a été à l’origine d’une évolution qui est un déclassement des subsécives et leur requalification dans la catégorie des terres occupatoires que les possessores pouvaient usucaper. Cette affaire des rives des fleuves en territoire divisé par la limitation démontre que l’arpentage portait en lui-même une rigidité qui le condamnait à terme. Pour comprendre les textes des arpenteurs, on doit restituer une espèce de ‘droit agraire’ on de ‘droit territorial’ que l’effacement de la ‘limitation’ a masqué dans le Corpus Iuris Civilis. On débouche alors sur une autre question: à quelle époque et dans quelles conditions les limitations ont-elles perdu leur rôle cadastral? Avec le temps, les anciennes limitations ne peuvent plus servir de cadre cadastral dans les termes où elles avaient été conçues plusieurs siècles auparavant, car le principe du modus implique une fixité contraire aux réalités. Dès lors les centuriations ne sont plus qu’un cadre planimétrique, auquel on se réfère pour la finitio more arcifinio. Perdant leur rôle de cadastre juridique et fiscal, elles deviennent des planimétries et des formes agraires résilientes. This essay considers whether diocese and parish could be held vicariously liable under article 2049 c.c. (Italian civil code) for child sexual abuse committed by clergy. The starting point is the judgment by Tribunale di Bolzano (21 agosto 2013, n. 679) that ruled in favour of liability and ordered to pay damages to the victims. The authors criticize the decision analyzing the requirements of vicarious liability, particularly the employment in relation to the structures of the Catholic Church and the connection of the tort to the task. It is not excluded that diocese and parish could be liable in negligence under article 2043 c.c. though and it is pointed out the relevance of the solidarity duty both in the civil society and in the ecclesiastic one. Key words: vicarious liability, employer’s liability, diocese, parish.